Experience Italy! On this special journey through Northern Italy, you will experience the true magic of the Italian culture and people, eat amazing food, capture stunning images, and explore the greatest cities that will take your breath away. This is a unique opportunity to be led with local knowledge by Adam DeSerio, learn photography, and gain travel skills while on your intimate Italian expedition (Group Size: Limited to 6 – 8 people). This trip is especially unique because your American guide, Adam DeSerio, has actually lived in Italy for nearly a year and can speak the language, providing you an inside local perspective – something very special compared to most other tours. Adam will also be recommending local restaurants and specific menu items along the way. Experience Italy! On this special journey through Northern Italy, you will experience the true magic of the Italian culture and people, eat amazing food, capture stunning images, and explore the greatest cities that will take your breath away. This is a unique opportunity to be led with local knowledge by Adam DeSerio, learn photography, and gain travel skills while on your intimate Italian expedition (Group Size: Limited to 6 people). This trip is especially unique because your American guide, Adam DeSerio, has actually lived in Italy for nearly a year and can speak the language, providing you an inside local perspective – something very special compared to most other tours. Adam will also be recommending local restaurants and specific menu items along the way. OPA! Welcome to Greece! On this special journey through Athens and the Greek Islands, you will experience the beauty and history of a country 3,000 years in the making. We will eat amazing food, capture stunning images, and explore the greatest cities that will take your breath away. This is a unique opportunity to be led by Adam DeSerio through Greece, with a perfect balance between historic discovery, beautiful photo opportunities, fun activities, and relaxation. On your intimate Greek excursion (Group Size: Limited to 8 people), Adam will be recommending local restaurants and specific menu items along the way. 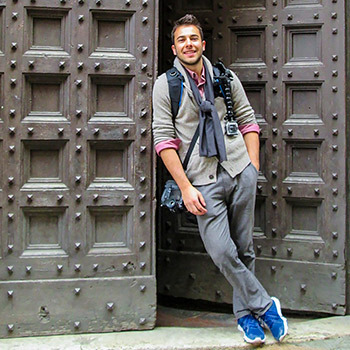 These amazing, once-in-a-lifetime, small-group tours are organized and led by Adam DeSerio, designed to offer an intimate perspective of culture, history, art, food, and photography, all while partaking in unique experiences that connect you with our travel destinations. Adam DeSerio has spend his entire life capturing the natural world around him, traveling on and off the beaten path, and enjoyed sharing the most important and most unique parts of the globe with people. DeSerio Tours is a culmination of all that, where Adam shares with you the “true” sides of our travel destinations. Want to stay on the main streets, assemble into a single file line, and put your earpiece in to be led to the most typical parts of the city… then this is not the trip for you. DeSerio Tours is about exploring, discovering, and going beyond what most tourists ever get a chance to experience and truly tapping in to the real beauty of the local life, food, history, and culture. You will end the trip feeling like you actually lived there, and were not just a distant outsider. Adam’s passion for travel and ability to organize trips you will find nowhere else, all while keeping the group size to 6-8 people make these tours something you will never forget!